"Mockingjay" muscle: There's only one film opening wide this weekend, but it promises to deliver the kind of boxoffice punch that should help Hollywood end the year in style! That's clear from the ultra-sizzling tracking scores for Lionsgate and Color Force's PG-13 sci-fi adventure "The Hunger Games: Mockingjay -- Part 1." It's tracking through the roof, just as you'd expect, with under-25 females, but it's also doing great with under-25 males. Moreover, while its scores are lower with men and women who are over 25, they're still way higher than anything else in the marketplace right now. It's, therefore, easy to envision a $150 million-size opening weekend that would put "M1" right up there with the blockbuster franchise's first two openings. 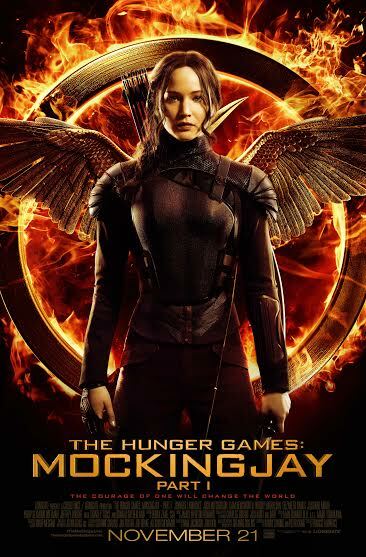 Based on the book by Suzanne Collins, "M1" is directed by Francis Lawrence, who directed the 2013 episode "The Hunger Games: Catching Fire." Lawrence is also directing "The Hunger Games: Mockingjay -- Part 2,"which opens Nov. 20, 2015 and concludes the franchise. "M1's" Nov. 21 launch at about 4,000 theatres is perfect timing since its second weekend will be the extended Thanksgiving holiday from Wed., Nov. 26 through Sun., Nov. 30. The first two "Hunger Games" episodes grossed a total of $832.7 million in domestic theatres. "The Hunger Games" opened Mar. 23, 2012 to $152.5 million. It did $408 million domestically and $283.2 million internationally for a global theatrical cume of $691.2 million. "Catching Fire" opened Nov. 22, 2013 to $158.1 million and did $424.7 million domestically. It grossed another $439.9 million internationally, bringing its worldwide theatrical cume to $864.6 million. Collins' trilogy of young adult books is a literary blockbuster with over 65 million copies in print in just the U.S. In "M1," Lionsgate explains in its production notes, "The story now accelerates to new, exhilarating levels as the futuristic chronicle of Katniss Everdeen enters into a new realm. The Games may have been obliterated for good, but the fight to survive is about to intensify. "Faced with the most daunting odds -- and watched by the eyes of a hopeful nation -- Katniss must put into motion courage, strength and empowerment against the all-powerful Capitol. This is the moment when she realizes she has no choice but to open her wings and fully embody the Mockingjay symbol. If only to save Peeta, she must become a leader." Katniss, havingsurvived the destruction of the Quarter Quell, awakens in a strange new world she never knew existed -- the dark underground of District 13, which was supposedly annihilated. She now learns that District 12 is rubble and Peeta's being held and brainwashed in The Capitol by President Snow. Meanwhile, Katniss discovers a secret rebellion is spreading quickly from District 13 throughout all of Panem. This is what will put her at the center of a plot to hack into The Capitol and turn the tables on Snow. 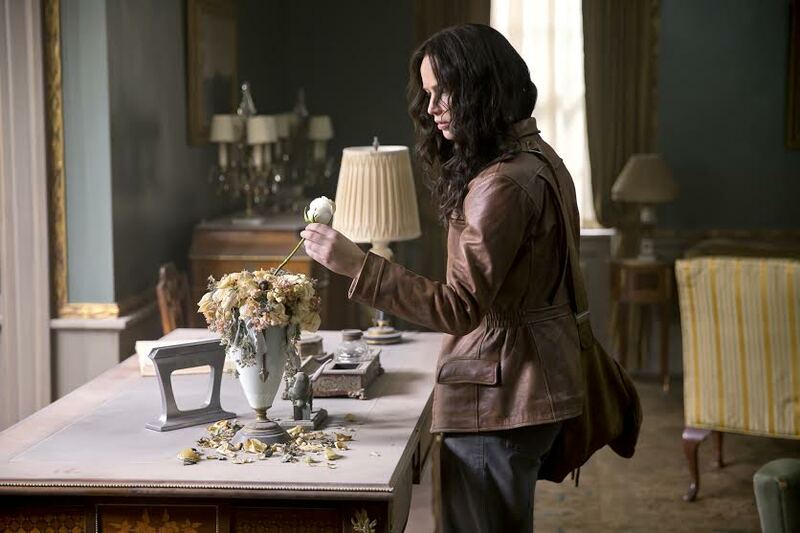 "Emotionally, Katniss is like a foreigner in a strange land as this story begins," explains director Francis Lawrence. "This is the time when she realizes she can't stand by and do nothing. There has been too much deception and the people Katniss loves are in danger. She will do whatever it takes to keep them safe." The stakes have always been high, he adds, but "now the entire world opens up. The Games themselves are gone, but threat of oppression now permeates all of Panem. This chapter gave us a chance to reveal entirely new locations with amazing action sequences." Jennifer Lawrence says she was excited "for Katniss to come into her own as a leader, but she's still a very reluctant hero. In the first movie, she wanted to save her family. In the second, she tried to save her friends and herself. Now, she starts to realize the impact she has on the wider world and that she has a choice to lead this battle for what is right." As an actor, she notes, her challenge was that Katniss awakens in an entirely new environmentand must reinvent herself from nothing. She's left behind her old life as a District 12 victor and has entered a new world unlike anything she's known before. "She has to get used to a new way of life in District 13," says Lawrence. "Everything is deeply unfamiliar and it's all underground, so she can't even go outside or hunt." What was it like playing Katniss for the third time in this very different world? "She felt almost like an entirely different character because she is so stripped down and feeling so empty," replies Lawrence. "It's something that truly does happen to people after traumatic events like she's been through. Katniss still has the same core, but she's in a completely different place inside and out." When Katniss assumes her new public role of the Mockingjay, President Coin asks her to appear in a series of "propos" – viral propaganda videos used by District 13 to communicate with and inspire rebels throughout Panem. "She goes into the propos feeling like a pawn, like the Mockingjay is just a symbol she's not connected to or passionate about," Lawrence says. "The whole idea of the propos is to get people fired up, to band together – so Katniss faking at being something that she's not doesn’t work. It's only when she sees the human cost in District 8 that a true spark is ignited. The more she sees, the more it becomes a personal fight for her." For Francis, it was rewarding to see Lawrence take Katniss into such new emotional territory: "It's incredibly complex to track somebody who is going through so much emotionally. Katniss has incurred a lot of damage, and now here she is trying to figure out where she stands in the world, whether or not she trusts the people in District 13, and whether she wants the responsibility of becoming a part of the rebellion. Jen has done the most amazing job with every nuance." Nina Jacobson, a producer of the franchise, points out that, "When Katniss goes to District 8 and says, 'If we burn, you burn with us,' for the first time she sees the impact that she has on people. Those moments – where Katniss owns what and who she is – really give me the chills. "It's a very tense and powerful story and the emotions on screen are surprisingly deep. It takes you to places you will not expect to be taken. It's provocative, thoughtful and up to the last minutes of the film, the way it unfolds is shocking. This part of the story is important to tell -- about how powerful a person's voice can be. It is always easier to follow the person in front of you, but I think we all have a Mockingjay in us. We all have the ability to make a stand and do the right thing." "M1" reveals for the first time Panem's most secret place -- District 13, where rebels have established their own society deep underground. Lionsgate contrasts District 13 and The Capitol in this way: "The Capitol is sensationalist spectacles, over-the-top garish hues and gleaming lights. District 13 is steeped in shades of gray, claustrophobia, conformity and the stark reality of what’s happening in the Districts. While The Capitol has been living high on the hog off the people, District 13 has been biding its time, preparing for the day when they would finally take a stand. "Up until now, only The Capitol knew about District 13, having carved out a non-aggression treaty that allowed it to exist so long as it stayed underground. As rumblings of war begin in earnest, District 13 and The Capitol are pitted against each other in a battle of images designed to win support – and key to it all is the ultimate District 13 symbol and foe of The Capitol -- the Mockingjay." "What we discover is that 13 was bombed in the Dark Days 75 years earlier," Francis points out. "It was a graphite mine with old nuclear facilities. There were survivors, and instead of giving up, they moved underground and created an alternative civilization outside The Capitol, hidden from view. "They've created a very ordered, militarized civilization, where people are trained as soldiers from a very early age. All this time, they've been waiting for a rebellion to start so they could take back The Capitol." 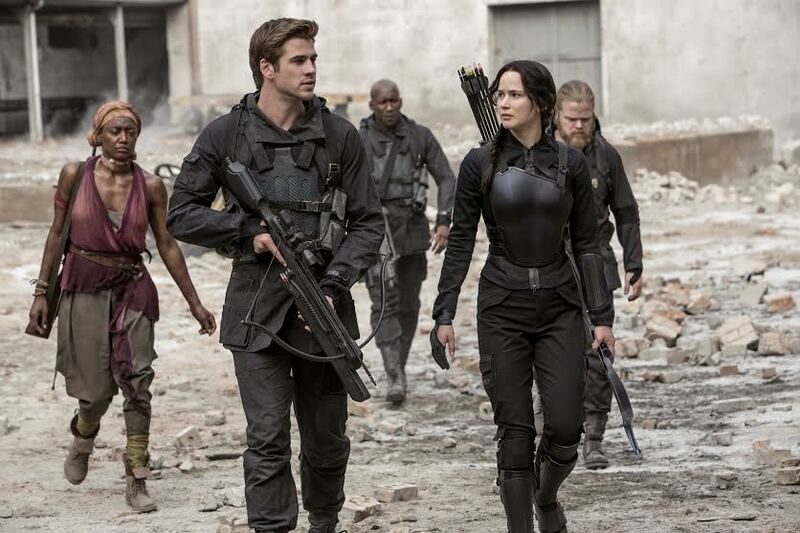 Bottom line:Thanks to "Mockingjay" muscle, Lionsgate should clean up at the boxoffice.